More Chrysler Pacifica photos to go along with Michael's review. Boxier previous generation Chrysler minivan (actually a Dodge). 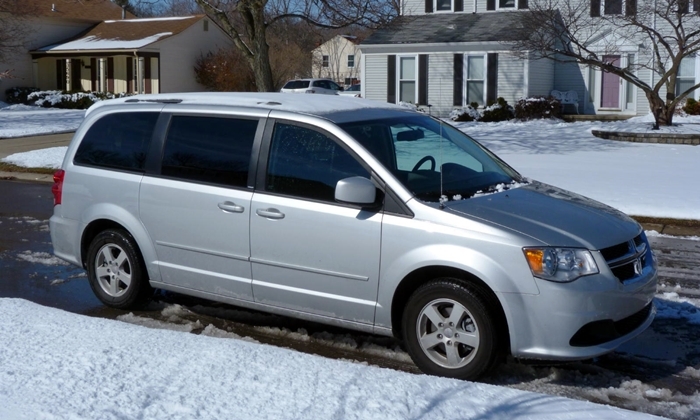 Among current minivans, the Kia Sedona has the sportiest styling. It can almost pass as a crossover. For an attractive Sienna, get the sporty SE, not this Limited. The Odyssey's exterior styling borders on bizarre. Interesting, or just wrong? The new Pacifica in Limited trim, in red, with the optional 20-inch wheels. From the driver seat the Sedona seems more like a crossover. But less open and no walk-through. Toyota toned down some aesthetic excesses. Still not attractive, but functional. Honda didn't keep it simple. Two screens, many controls. And plasticky. Comfortable driver seat in attractive cloth with contrasting brown stitching. The Pacifica's third row is competitive and much better than you'll find in any crossover. Far more cargo space behind the third row than in any crossover. Even without the Limited's power option the third row stows quickly and easily.